CSIRO partner Oventus Medical Ltd has today listed on the Australian Securities Exchange raising $12m. Maurice Hvorat: Snoring is not a problem if you’re planning on living your life on your own, but if you’re planning on sharing a bed with somebody then snoring can be a major issue. So I’d been trying to find for years now an avenue that I could stop snoring with, and over the years I’ve tried different other things, like other types of appliances to put in your mouth, but with very limited success. And at this point a little while ago I found, I think it was on the internet, something about the Oventus thing being developed with CSIRO, and I thought look, it’s worth a try. So I joined up straightaway, got my appliance a couple of weeks ago, and had nothing but success since. So probably the happiest person in the world is probably not me, it’s probably my wife (chuckles), with not having to worry about earplugs or having to race off to bed earlier, or you know the potential of having to go and sleep somewhere else to get through the night. So, yeah, no it’s been a wonderful thing. Fantastic. Because of the moulding that’s done on your teeth it obviously fits like a glove as you put it on, and it sits snugly in your mouth. It takes really no getting use to at all. I think it’s just a little bit of a nuisance perhaps the first couple of minutes you’ve got it in your mouth ‘til your jaw reorganises itself to adapt to being pushed forward, or into the position that it’s pushed into, but then after that’s settled in, yeah, fine, no... there’s no discomfort really. It’s just a nice, comfortable, easy feeling. Yeah, I don’t know how 3D printers work, but it’s miraculous, isn’t it, just quite remarkable how that can happen. But, yeah, look it’s very comfortable, it’s incredibly light, yeah, it has no weight virtually at all. It fits, like I said, like a glove once it’s been fitted to you personally, and it’s very, very smooth on the inside. One of the issues that I’ve had with other appliances in the past was they have areas where they adjust different parts of the appliance, and those areas are little areas of metal that your tongue can’t help but find, and you have a natural instinct to rub things that are difficult or sharp inside your mouth, so I found that when I was using other appliances, or one other appliance in particular, my tongue would be red raw by the morning, and still not be able to stop snoring, so there wasn’t much future there (chuckles). Whereas this has no sharp edges, it’s all smooth, and it’s very comfortable through the night, you don’t find yourself rubbing your tongue across anything at all. The first morning afterwards, I’m not sure if it’s because I had a different type of appliance in my mouth, or because I slept better, I’m hoping to be able to say because I slept better, I just found myself getting up earlier, much earlier than I normally would, feeling much brighter than I normally would, and getting involved in my exercise as early as possible. So, yeah, I’m loving it. And I found since then that I have been getting up considerably earlier and just enjoying my days a lot more. And I think another part, too, is that one of the things I use to find that I use to do a lot of before was having afternoon naps just because I was tired, but now I find that I’m getting through the day feeling much more energetic and much more awake than what I did before. I go down to the beach, I walk for about, I guess it’s about seven or eight k’s every morning, then I come back and have my breakfast and get on with the day. Where before I was a bit slack, I was probably getting up about eight, nine, that sort of time, whereas now I’m more around the six, seven mark and going straight to the beach, getting back. It gives a lot more hours in my day. My main concern was really just snoring and making my partner uncomfortable, and making her life difficult. Like that’s what I didn’t want to do. The sleep apnoea part was really not much of an issue for me from my perspective, but now that I’ve learnt more about the sleep apnoea part I’m finding that I’m particularly happy that I’ve gone down this road, because if this is able to relieve my apnoea as well as the snoring, well this is just a miracle. Yeah, fantastic. So it may give me a longer life, hopefully, give me a happier life with my wife, I mean what more do you want, really? Fantastic. Really happy. Oventus , who manufacture sleep apnoea devices, has invested heavily in R&D with CSIRO over the past two and a half years, helping to hone their production process and grow their business. The Brisbane-based company first approached CSIRO in 2014 when dentist Chris Hart had the idea for a mouthguard with airways that would assist airflow bypass the sleep apnoea sufferer’s airway obstructions including from the tongue, soft palate and nose. Dr Hart asked CSIRO if they could 3D-print the device from titanium. The result was an initial prototype which has since successfully completed clinical trials and been named the O2Vent™. In April this year, the device received FDA clearance opening up the US market for the company. 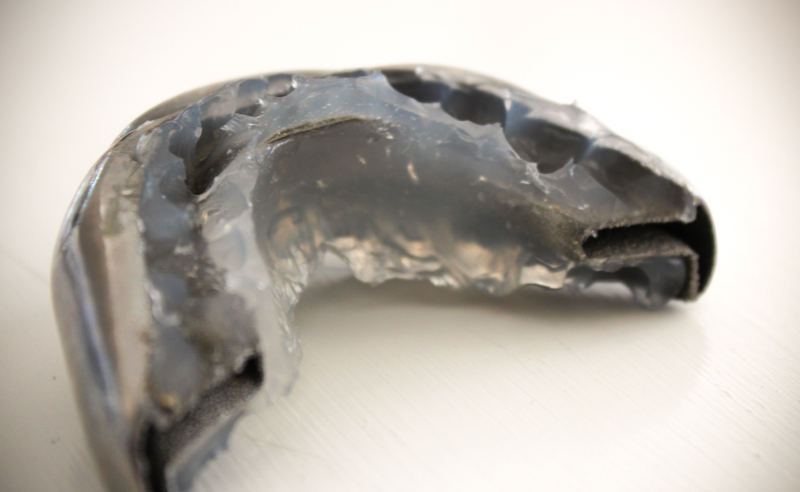 The O2Vent is a customisable mouthpiece which is 3D-printed to the precise dimensions of a patient’s mouth, ensuring optimal airflow during sleep, reducing the effects of snoring and sleep apnoea. Oventus Founder Dr Hart said CSIRO provided the opportunity to access new 3D-printing technologies through their Lab22 facility. "This allowed us to explore new and innovative manufacturing techniques with a reduced investment risk,” Dr Hart said. 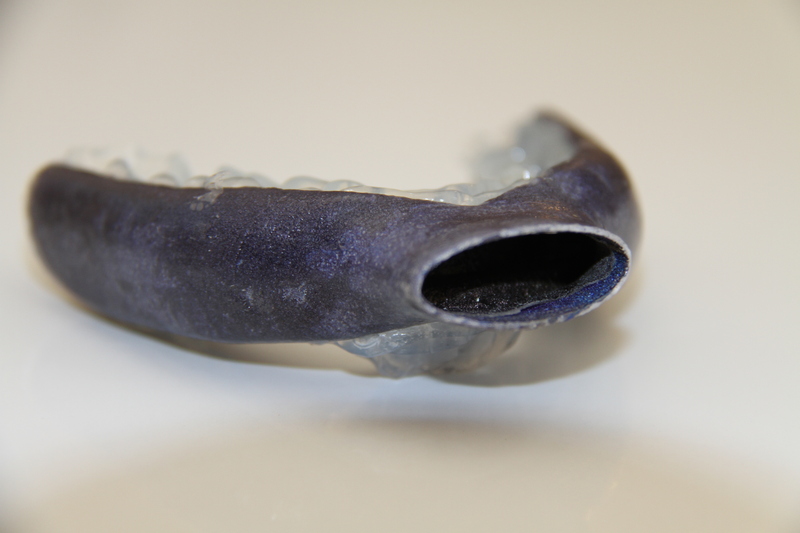 “Using 3D-printing to manufacture the O2Vent sleep apnoea devices offered us huge advantages over traditional manufacturing methods including speed and cost. "This partnership has made us globally competitive," he said. Oventus is hoping O2Vent will disrupt the multi-billion dollar market for sleep apnoea solutions. The US Sleep Foundation estimates that 37 million Americans regularly suffer from snoring. The global sleep disorder market is estimated to be worth $50 billion annually. An estimated one million Australians suffer from sleep apnoea. The original prototype was made in CSIRO’s Lab 22 Innovation Centre in Victoria using an Arcam 3D-printer. CSIRO’s Mr Stefan Gulizia said the idea of designing and 3D-printing completely customised mouthpieces seemed revolutionary at the time. “It has been exciting helping Oventus progress this novel idea to a manufactured product and seeing the success of the company as it lists on the ASX today,” Mr Gulizia said. Lab 22 is one of Australia’s leading facilities for metal additive manufacturing and has assisted in world-first medical breakthroughs including 3D printed body parts for patients in Australia and in Europe. Oventus’ fully-subscribed IPO has raised $12 million that will be injected into the commercialisation and distribution of their O2Vent sleep apnoea devices. 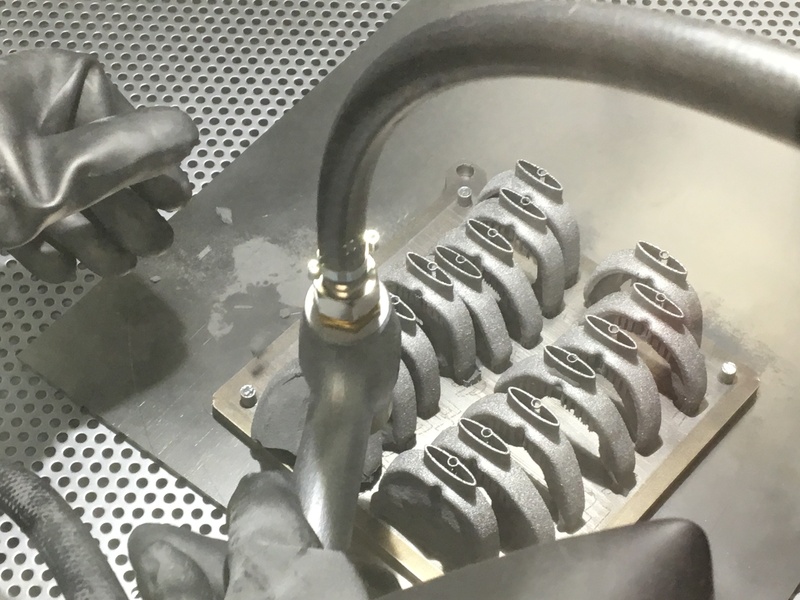 After the 3D-printing process, an air gun is used in the powder recovery system (PRS) to reveal the hidden O2Vent™ devices within the titanium block. Surplus powder is recovered for further use. 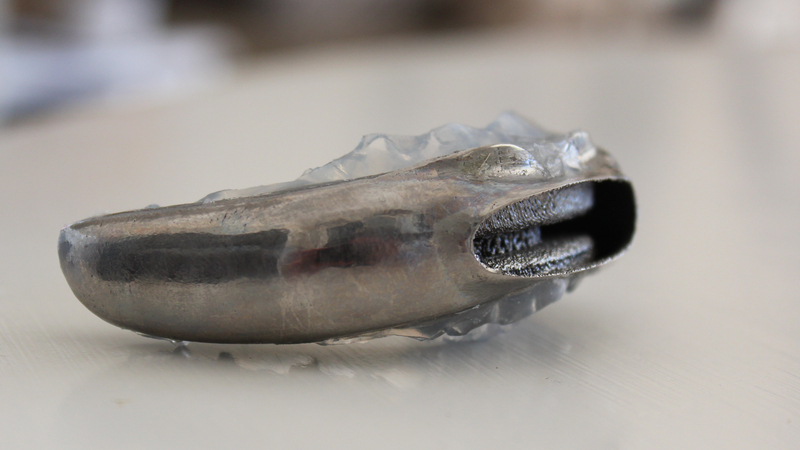 CSIRO partner and manufacturer of 3D-printed titanium sleep apnoea devices, Oventus, lists on ASX with fully subscribed IPO.